Glen Ivy Hot Springs is an all-day wellness escape offering spa treatments, healthy food, activities, and more. 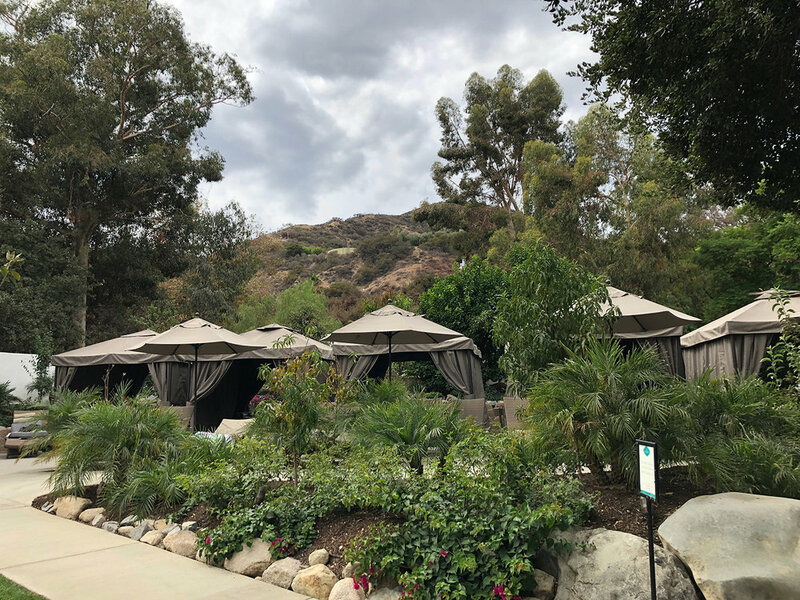 Recently, The Spa Insider had the special opportunity to spend an entire day at Glen Ivy Hot Springs, which is located in Corona, California. It’s the ultimate getaway for those looking to relax and indulge in a day of wellness-related activities. Glen Ivy isn’t your typical day spa experience—it’s way better than that. From healing mud treatments and massages to an underground grotto and a secret garden, it’s the equivalent of a spa playground or theme park for adults! Featuring only one path to the center, Glen Ivy’s Labyrinth offers the chance to clear your mind and practice reflection while walking through. Its wide selection of spa and beauty treatments. Daily class offerings including yoga and Aqua Zumba. Indoor Roman baths, showers and steam rooms. Exfoliating and detoxifying mud bath. Visitors can relax in multiple sun-drenched decks or shady spots. Upon our 11 a.m. arrival, we started our day with a healthy and delicious lunch at Ivy Kitchen, Glen Ivy’s main restaurant that prepares a variety of fresh, farm-to-table dishes. We ordered the Mediterranean Gem Salad (herb-marinated chicken breast, Kalamata olives, grilled artichoke hearts, sun-dried tomatoes and a parmesan lemon caper vinaigrette), along with the Turkey Avocado Club, fresh squeezed orange juice and iced tea. Other items that looked good: Plant-Based Sliders, Greek Chicken Lavash Wrap, Ahi Burger and Chicken Nachos. (Next time!) Glen Ivy is also home to GOCO Cafe, which serves Starbucks and quick eats like salads, sandwiches, baked goods, and more. Ivy Kitchen serves a variety of healthy and delicious dishes. After filling up at Ivy Kitchen, we decided to try out some of the property’s different hydrotherapy experiences. With 19 different water experiences to choose from, including a Roman bath, we had more than enough options to enjoy before heading to our Grotto treatments. 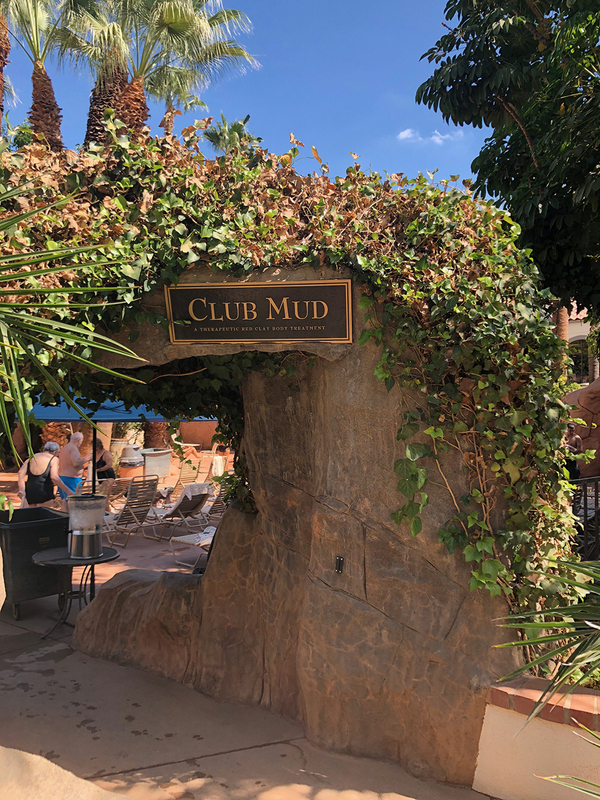 Club Mud features a spring water mud pool that exfoliates and cleanses skin. There are numerous benefits associated with bathing mud. 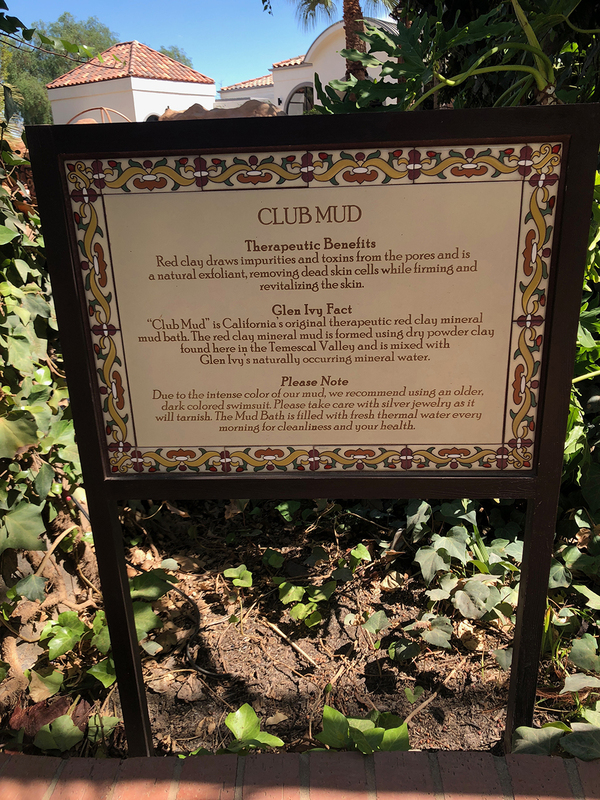 After trying several of the different water options, we stopped by Club Mud, where we applied red clay mud to our skin in order to exfoliate and draw out impurities. After relaxing in the warm ‘Wafa’ cave and letting the mud dry, we rinsed off and immediately noticed how much softer our skin felt! The Secret Garden is a relaxed, secluded area with fountains, a sunny lawn, hammock and shaded deck. Next stop: the Grotto. We took an elevator underground, where we were painted head-to-toe in a hydrating body masque made of a mixture of warm aloe vera, coconut oil, eucalyptus and lavender. We relaxed for 15 minutes in the gently heated cavern, which gave our skin the opportunity to soak up more of the moisture. After, we rinsed off under individual showers before sipping on tea and snacking on fruit in the cooler grotto. What’s fun about this experience is it’s a group activity, so you can do it with friends if you like! Tip: Be sure to set aside 30-45 minutes for this experience. Reservations are $25. Private cabanas are available for daily rental in the Secret Garden for the ultimate relaxing experience. After the Grotto, we took a walk through the Secret Garden, which is Glen Ivy’s most recent upgrade. This private area is set off to one side and is a more secluded area for those looking for peace and quiet. It features elegant fountains, a shaded deck, a hammock and five cabanas. You can also order food and drink services in this area. Private cabanas cost $250 Tues-Thur and $275 Fri-Mon, and can accommodate between 2-4 guests. They include sun loungers, bath robes, reserved parking, chef’s selection of seasonal fruits and citrus-infused water. To book, click here. The Grotto is a full-body, underground moisturizing experience. Finally, it was time for a massage. We headed to the Massage Villas, which are located towards the front and offer a relaxing and peaceful spa experience away from the crowd. I received an Aromasoul Elements Massage—a full-body Swedish massage that blends jojoba oil with essential oils. My therapist offered me a choice between an exotic Oriental blend of vanilla, jasmine and mimosa to relax, and an uplifting Mediterranean blend of orange, bergamot, basil and anise to revive. He did a fantastic job, using the perfect amount of pressure and really working on some of the tight knots in my back and legs without causing me pain or discomfort. I emerged feeling relaxed and rejuvenated, not to mention that my skin and hair smelled of the amazing aroma of the oil blend that had been incorporated into my treatment! Guests can enjoy spa treatments in one of Glen Ivy’s Massage Villages. After, we headed to The Chill Zone, a cute little shop at Glen Ivy that serves fresh coconuts, frozen yogurt and smoothies. There’s also Lounge 1860, a stylish covered bar that makes a variety of mixed drinks, as well as beer and wine. If you’re more of a night owl, Glen Ivy does a special summer event series known as “Twilight Sundays,” which features live DJs, drinks and dancing. And the best part is, you don’t have to change out of your swimsuit! This year’s final Twilight night takes place on October 27. For more information, click here. We could not have asked for a better day, and were already discussing plans to come back. Whether you’re celebrating a birthday or bachelorette, or you’re looking for a fun outing to enjoy with a large group of friends, significant other or yourself, Glen Ivy offers the complete package that you can customize according to your own needs. But don’t take our word for it—you need to come and check this place out for yourself! Don’t forget to grab a cocktail at Lounge 1860. Tip: Arrive 30-45 minutes before opening so you can find parking near the entrance, check in quickly, and secure a prime spot near one of the pools. Parking: Free with admission. There is a huge lot located right out front. Get more insider’s tips by visiting our Glen Ivy Hot Springs Spa Profile. The relaxing retreat in the heart of Seoul offers signature treatments inspired by Korean traditional healing therapies. Enjoy the ultimate relaxing spa experience in one of the luxury resort’s over water treatment suites. The elegant spa in Paris pays homage to the iconic designer. The resort’s Kahaia tree-inspired spa combines ancient traditions, native ingredients and transformative treatments. From relaxing facials to body contouring options, this boutique medical spa in Encino, California utilizes the latest technology to help clients achieve radiant beauty. Spa Montage Deer Valley is a luxury spa set amidst natural beauty and the pristine slopes of Deer Valley Resort in Park City, Utah. The Spa at The Grand in Salt Lake City, Utah is a luxury four-story spa that offers five-star service, inspiring grand experiences and memories. JARA Spa in Phuket, Thailand is inspired by the five pillars—elements of the ficus tree that collectively nourish, invigorate and heal. Indulge in true splendor at The Eden Spa in Hotel Eden, one of the most iconic luxury 5-star hotels in Rome. This rustic retreat in Kent Island, Maryland offers the finest treatments and the opportunity to enjoy peace, tranquility and relaxation.